The Davis Street Transfer Station processes 7 million pounds of recycling daily. Although they're designed and marketed as environmentally conscious alternatives, bioplastics are confusing consumers and causing headaches for waste management facilities. Not only are compostable bioplastics erroneously thrown into recycling bins, they don't compost as well as advertised. 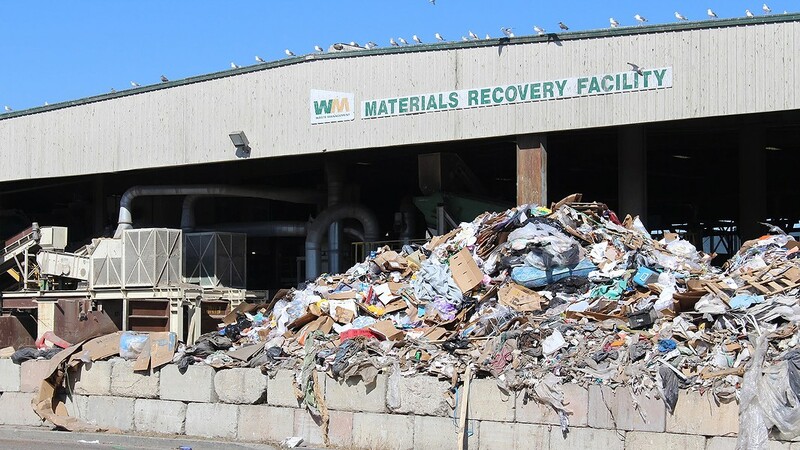 Jay X. Ramos, senior district manager at San Leandro's Davis Street Transfer Station, a waste management facility, said consumers are inadvertently contaminating the waste stream when they put bioplastics into their recycling bins, because waste facility sorting machines can't distinguish between bioplastics and plastics. His workers, as a result, must manually separate bioplastics from plastic recyclables. And if they don't remove them, the whole "stream" of recycling ends up being "contaminated," said Ramos. "It's like a restaurant using one pan to cook everything." Bioplastics are newly popular, but they're not a new concept. The plastics industry has seen them as a viable alternative to petroleum-based plastics since the early 20th century. But low oil prices allowed petroleum-based plastics to reign. It wasn't until the 1970s that the bioplastics industry began to take off. The global market for bioplastics is now projected to grow from $2 billion in 2014 to roughly $44 billion by 2020. Some of the earliest bioplastic makers experimented with a wide range of materials, including milk, hemp cellulose, and bacteria. There are a wide range of bioplastics made today, but that only complicates their disposal. Some don't break down at all. Others contain a mixture of bio-based material, like starch, and petroleum plastic, which make them recyclable but not compostable, as illustrated in "B.A.N. List 2.0," a report published by a number of environmental organizations, including the Surfrider Foundation. And other bioplastics that are made from natural substances such as cellulose, chitin, polylactic acid (PLA), and polyhydroxyalkanoate (PHA), are designed to break down into compost but don't compost easily. Isabel Rodriguez-Vega, Sustainability Programs coordinator at Bishop O'Dowd High School in Oakland, learned this when she found out that her school's compostable cups and utensils were ending up as trash destined for the landfill. She found out that the school's bioplastics, made from PLA, were too "tough" to break down in a compost facility. Consequently, the waste management facility would have to remove the bioplastics from the stream of food waste they mingled with, but often there were too many of them to sort out. In such cases, the facility considered the whole compost bin "compromised" and sent it to the landfill. The problem, she learned, was the same for people disposing of bioplastics at home. If too many bioplastics are mixed with food waste or yard waste the whole "green" bin can't be composted, so it ends up in the landfill. The news changed her whole perspective on bioplastics. "It seems like just a band-aid solution to the real problem — single-use stuff," she said. Bioplastics pose other problems, too. The Ecology Center, a nonprofit in Berkeley, also points out that compostable bioplastics have been engineered to last longer than their plant-based components, so that they don't break down as easily as food waste. Add most bioplastics to a backyard compost pile, and they likely will never become usable compost. To become compost, they'd need to be broken down in the humid, hot conditions found in industrial composting facilities. But even these facilities often don't have the time to compost bioplastics, said Sandra Curtis, director of Innovative Projects at the Plastic Pollution Coalition, an alliance working toward a plastic-free world. Where demand for compost is high, as it is in the Bay Area, there is a limit on the amount of time composting facilities have to break down the plastics, which can leave "plastic" pieces behind in the compost. "There is so much demand in the Bay Area for composting — they have short cycles," said Samantha Lubow, Environment Initiatives coordinator at Cal Dining, which runs on-campus dining services for UC Berkeley. And because so many bioplastics contain potentially toxic petroleum-based synthetic materials, they can leave plastic pieces behind even when successfully composted, as noted in the Earth Island Journal. That makes them unsuitable for generating organic compost, because organic production standards under the Organic Materials Review Institute (OMRI) require that any compost be free of environmental contaminants, such as synthetic fertilizers and pesticides and, yes, bioplastics. "Everyone wants a magic solution: 'I can buy this plastic material, and throw it away, and get it composted.' It's not that simple," said Jessica Jones, owner of JK Jones Consulting & Engineering, which specializes in waste management. "Turning something into a plastic doesn't guarantee it'll return to its natural state." In the East Bay, institutional bioplastics consumers, like UC Berkeley, are trying to circumvent the problem. Izzy Parnell-Wolfe, zero waste specialist at Cal Zero Waste said the university has installed new waste bins designed to reduce consumer confusion. The effort is part of the university's Zero Waste by 2020 goal, which has already diverted 69 percent of its solid waste from landfills. Big Belly Solar units across campus are covered with pictures that tell people what to toss where. Items such as paper bags and food waste go into the "Compost" bin, glass bottles go into the "Bottles/Cans" bin, while candy wrappers and chips bags go into the "Landfill" bin. Cal Zero Waste also provides reusable, traditional metal utensils at university restaurants. "If you go to a place and there are only disposables in front of you, you'll take what's given," Parnell-Wolfe said.